Wool and Wheel: About L.M. Montgomery. I'm ashamed to admit that I've only read the first Anne book, and that was years ago. I really enjoyed it, and I went on to collect the next three or four in the series. I watched the adaptations and loved them (the first two, anyway...let's not talk about The Continuing Story). But for whatever reason, I never read the rest of the series. Or anything else by L.M. Montgomery, for that matter. Even though I've only read one of her books so far, L.M. Montgomery feels like an author that I will love. Usually I'm wary of authors who have written dozens of books...it always makes me wonder if their stories are all similar, because how can one person have that many different stories in her head? (I'm no writer, though, so maybe I just don't understand.) But with Montgomery, I'm just in awe of her, because most of her books sound interesting to me. These beautiful new editions have recently made me even more interested in reading more of her books. They are seriously gorgeous and the covers have such a soft, nice feel. Even the spines are pretty! I suspect that many of you are big fans of L.M. Montgomery, so I'm wondering...which of her books are your favorites? Which do you recommend? The ones I'm currently most interested in are the Anne series and The Blue Castle (obviously, since I own them), plus the Emily books, A Tangled Web (despite the mediocre reviews), and Jane of Lantern Hill. "The Blue Castle" is one of my pick-me-up books. It never fails to cheer me up. It's just a pleasant, easy read. I've re-read it several times. I also love the Emily series. As much as I LOVE the Anne series, I sometimes think I enjoy the Emily series a tad more. (Although I do loathe one of the characters, but really.... I think we're supposed to loathe him). I didn't know about the books with the new cover art! Thanks for sharing that. (I'm a total sucker for a nice book cover). I'm so excited about reading The Blue Castle. People seem to really love it! :) I'm a sucker for pretty book covers, too. I owned the first four Anne books in ugly, beat-up old copies from Goodwill, so I've been really enjoying collecting these new covers (gradually) to replace my old ones. :) When I buy more of Montgomery's works, I'll definitely be buying them in these editions, too...they're really nice. Oh! I adore pretty much all of L.M. 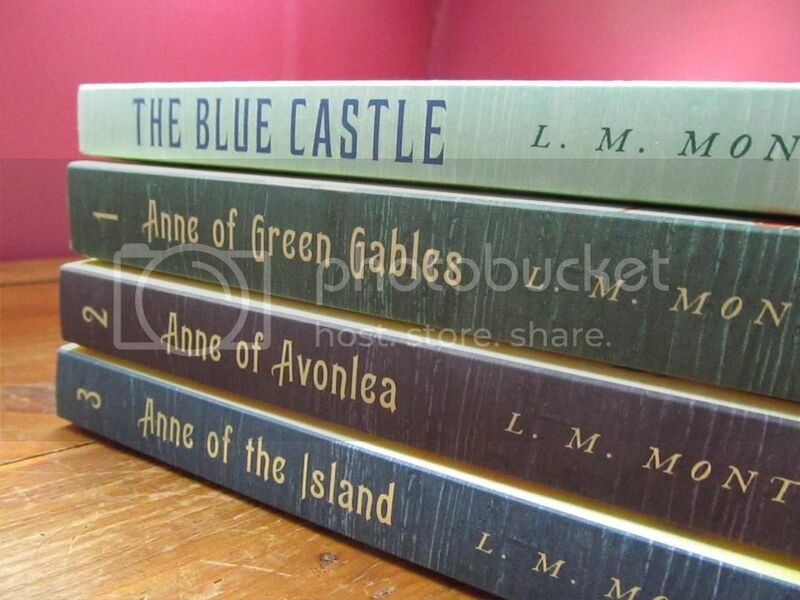 Montgomery's works ~ the Emily books are wonderful, I love a A Tangled Web, The Blue Castle and all of the Anne books. There are also a heap of her short stories available for free download for the Kindle; they are a really fun to read and some of them you can see where she gleaned ideas from them for her longer books. Yes, from what I've heard, her books have a similar homey feel, which I think I'll really appreciate. :) I'm glad to hear that you love A Tangled Web...it seems to get pretty mediocre reviews, but I think it sounds interesting! she is one of my favorite authors! I own everything by her, but her Emily series is by far my favorite. The movies are so good! Yes, people seem to love The Blue Castle. You definitely need these new covers. Ha. :) At least, that's what I tell myself, too. The Anne books have always been my favorite (especially Anne of Green Gables, Anne of Avonlea, Anne of the Island, Rilla of Ingleside, and Anne of Windy Poplars – in that order). Part of their elevated status may come from discovering them first, but I guess I'll never know. :) I also love The Blue Castle, the Emily books, and Kilmeny of the Orchard. The ones I've enjoyed least are A Tangled Web, Magic for Marigold, and the Pat books – they were ok, just not ones that I would likely read again or tend to recommend to anyone other than a die-hard fan. I don't normally like short stories (because they're too... short ;), but I actually like most of Montgomery's.